Description CEP-18770 is a novel orally-active inhibitor of the chymotrypsin-like activity of the proteasome with a cellular IC50 value of 3.8 nM. As an inhibitor of proteasome, CEP-18770 induced an accumulation of ubiquitinated proteins over 4 to 8 hours with a proﬁle similar to that observed after bortezomib (another proteasome inhibitor) treatment. Intravenous (from 1 to 6 mg/kg, 2q7d×8 injections) or oral administration (in a solution of 3% DMSO, 10% Solutol, and 87% sterile NaCl 0.9%, twice-a-week injections for 4 weeks at doses of 7.8, 10, 13 mg/kg in a volume of 20 mL/kg body weight of mouse). Intravenous administration of CEP-18770 exhibited sustained and dose-related tumor weight inhibition with RTWI of 100% at all tested doses. CEP-18770 also exhibited dose-related increases in the incidence of tumor-free mice by the completion of the studies (120 days after tumor transplantation) within the 3- and 4-mg/kg intravenous treatment groups, 89% and 80%, respectively. Oral administration of CEP-18770 resulted in a significant reduction of tumor weight and notable dose-related incidence of complete tumor regression (75% incidence of CR and 25% tumor-free mice at 10 mg/kg orally). 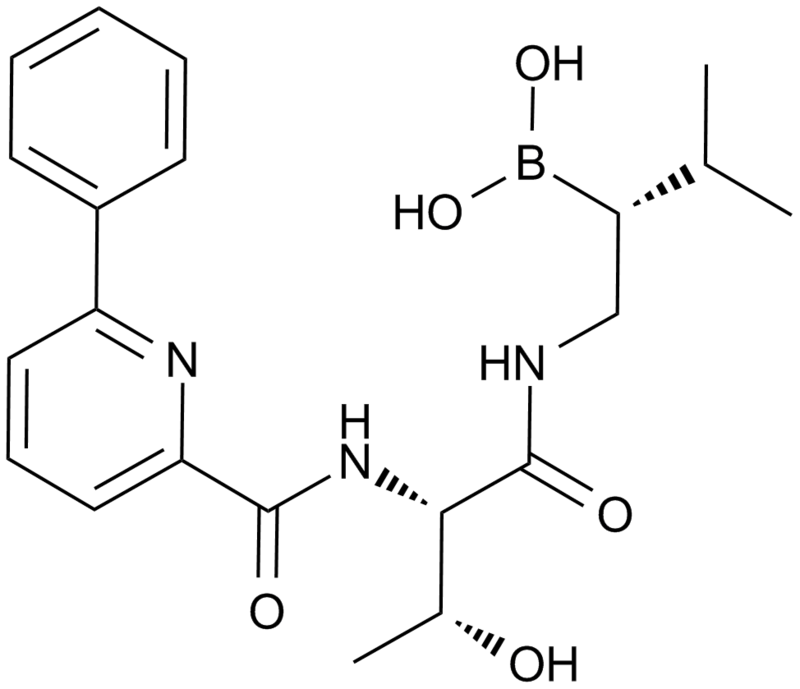 CEP-18770 is a novel, potent and reversible P2 threonine boronic acid inhibitor of proteasome that inhibits proteasome’s chymotrypsin-like activity, with the value of inhibition constant IC50 of 3.8 nM, by down-modulating the activity of nuclear factor-KB (NF-KB) as well as the expression of a few NF-KB downstream effectors. Preliminary results of multiple studies have shown that CEP-18770 exerts potent antitumor activities against human multiple myeloma (MM) cell lines by inducing apoptotic cell death, exhibits a strong antiangiogenic activity suppressing RANKL-induced osteoclastogenesis, and displays a favorable cytotoxicity profile towards normal cells including epithelial cells, bone marrow progenitors, and bone marrow-derived stromal cells.